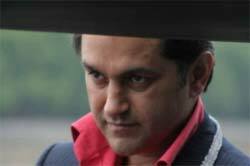 Ali Abdolrezaei was born 10 April 1969 in Northern Iran. He completed his primary and secondary education at his city of birth and after receiving his Diploma in mathematics passed the nationwide university entrance exams. He graduated with a Masters degree in Mechanical Engineering from Tehran Technical and Engineering University. He started his professional poetic career in 1986 and became one of the most serious and contentious poets of the new generation of Persian poetry. Ali has had an undeniable effect on many poets of his generation by his artistic concepts of proposals through the medium of his poetry as well as speeches and interviews. And he is one of the few poets who succeeded to express his independent poetic individuality. Publication of eight varied books of poetry: “From Riskdom,” “Shinema,” So Sermon of Society”, “Improvisation”, “This dear cat”, “Paris in Renault”, “You Name this Book”, “Only Iron Men live in the rain”, endorse his poetic creativity and power. Currently he has in publication a poetry collection “La Elaha Ella Love” and a multi-textual “Hermaphrodite” that have been followed by varied critical reviews. Nearly all well known poets and critics of Persian poetry have written about Abdolrezaei’s poems. In September 2002 after his protest against heavy censorship of his latest books such as Society and Shinema, he was banned from teaching and public speaking. He left Iran and after a few months stay in Germany, and two years in France, he’s been living in London for the last three years. Have you walked in the shoes at the foot of the stairs? Why don’t you saddle the horses’ neighing? I have heard, from this very line you are hearing, at the end of the poem I am writing, at first dusk descends a little, then it rains and in the end the sound of the unsaddled neighing of a herd of horses, is running in my shoes. isn’t it a sin to drag me so from bed to bed?